Six years old and it's just perfect. Starting to lose some of its bright colour and beginning to brown. Beautiful smooth dusky damson fruit flavours with a long lingering finish. Like a good claret but with lots of sweet fruit. 'La Cave' is Wamakersvallei's premium label and they really have nailed making consistently fine classic Pinotage. 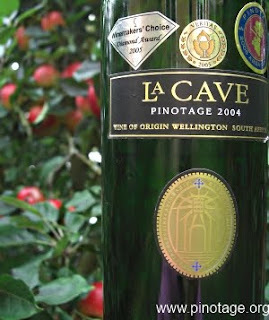 It is named after La Cave, the winery's arched brick cellar in Wellington. Do anyone know if La Cave is available in the United States? I'm a retailer in Ohio and have a customer wanting to buy some.